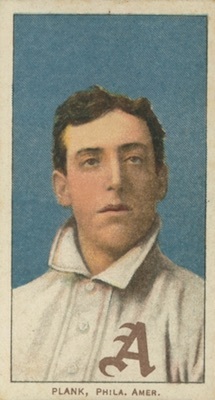 1909-11 T206 Baseball is called "The Monster" for good reason. It's one of the most widely-collected sets of any era. 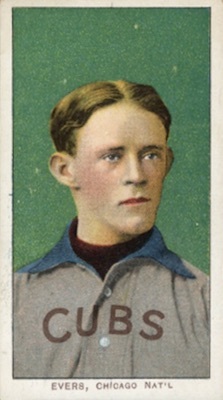 T206 also contains the single most famous card in the hobby, one recognized even by non-collectors. 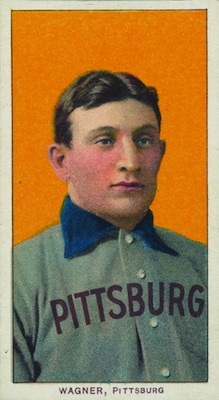 While most cards are easily obtained, the release has some very scarce options that are led by the nearly-mythical Honus Wagner card. This all combines to form a set that can be collected in a wide variety of ways. There is truly something for almost anyone in T206 Baseball. Shop for Professionally Graded T206 Cards on eBay. 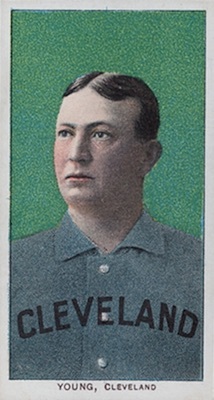 The T206 designation comes from Jefferson Burdick in his American Card Catalog in the 1930s, but the cards are also known as "white borders" due to their design. That border surrounds a strikingly colorful lithograph, with simply a last name and city below the picture in black ink. Most of the card fronts are vertically oriented, but a small number feature a horizontal layout. 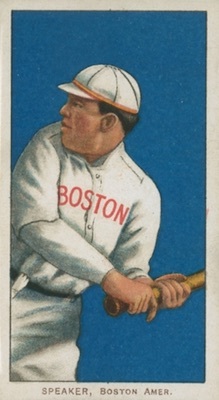 However, there are a lot of similar white-bordered sets of the era (many of those even using the same pictures), which causes some confusion among collectors. 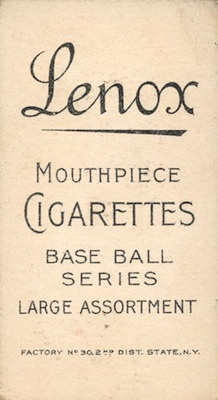 Not all cards are found with all the backs, and there are even different variations among the various brands themselves that push the number of total back designs to around 40 options. 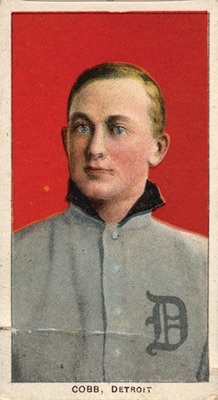 Without question, the Ty Cobb back is the rarest and it was believed that less than 20 existed until a new find — dubbed The Lucky 7 — unearthed seven more examples. However, not all collectors view this variation as part of the T206 master set. 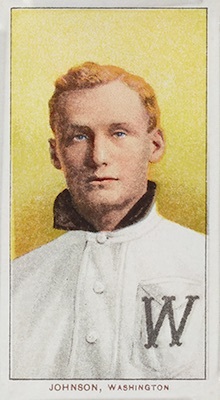 In all, there are more than two thousand different front/back combinations in the T206 White Border Baseball set, which makes putting together a true master set to be a nearly impossible task without a considerable amount of cash and even more hobby connections. 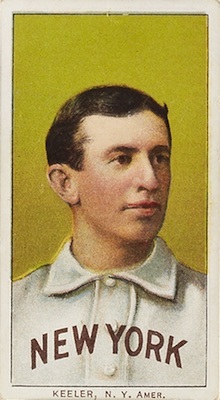 The T206 White Border Baseball set was issued over a period of three calendar years, from 1909 through 1911. 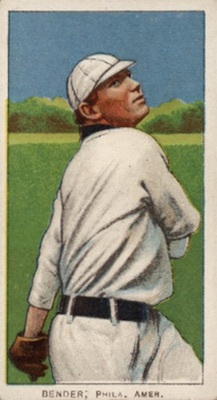 As a result of several different printings, some players have multiple images and poses. 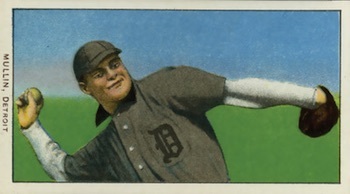 For example, Ty Cobb has four different images, and Hal Chase has five. 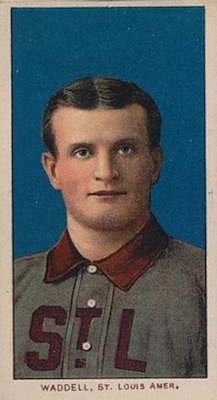 Several players are shown on two different teams due to trades and there are quite a few misspelled names. 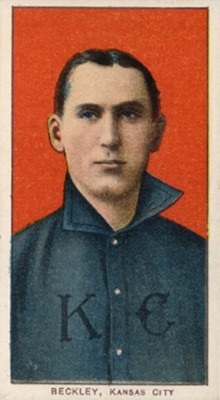 Southern League players are somewhat tougher to find in T206 White Border Baseball because they were only printed in 1909 and 1910. There are also scarcities that resulted from a card being removed when a player left the game or was traded. 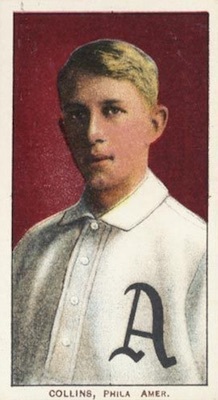 Bill O'Hara and Ray Demmitt are two such players. Minor league players are also included in T206 as well. 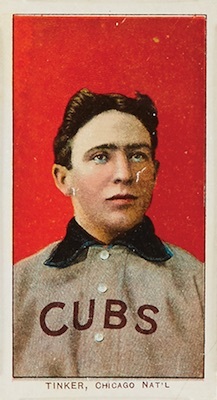 Of course, the most famous card in the hobby and a legend were created because of a star player who requested his card be withdrawn. Honus Wagner's T206 image is iconic, and sales of his card often command headlines because of the amounts involved. It's not the scarcest card in the set, but it's the most coveted. There has long been a disagreement about why Wagner's card was pulled early in the printing. Some say that Wagner was worried that kids might buy tobacco products to get his card, while others suggest it was a matter of getting paid. Whatever the reason, it's the most revered card in the hobby. 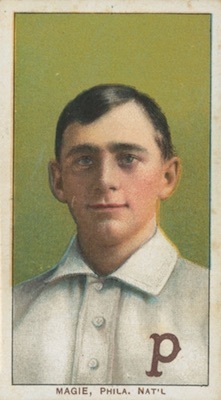 Another base card in very limited supply, Hall of Fame pitcher Eddie Plank's card was severely short-printed. Hobby legend states a printing plate broke early in the print run, but that is purely rumor at this point. 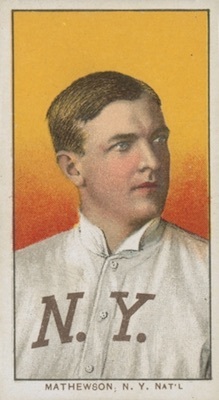 Among the key variations found in T206 White Border Baseball, Sherry Magee had his last name spelled "Magie" on some of his cards. Since the error was corrected in subsequent printings, the error card is quite valuable today. 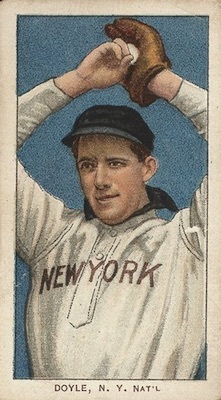 Also, a version of Joe Doyle's card lists "N.Y. Nat'l" following his name, while most of his T206 cards omit the league designation. 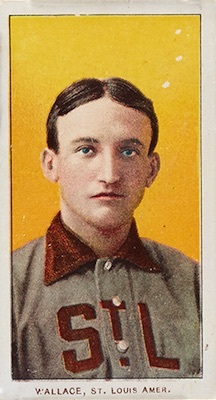 The Wagner, Plank, Magie and Doyle cards are viewed as the "Big 4" cards that aren't considered necessary to complete a T206 White Border Baseball set. However, they're cornerstones to any major collection. 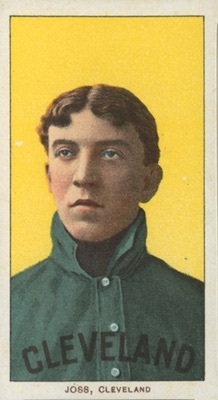 1911 T205 Art Fletcher Giants SGC 40 !! 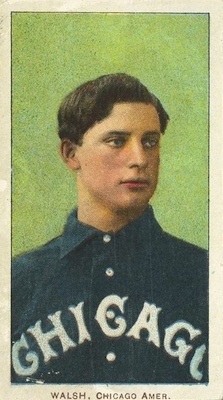 1911 T205 Charles Hanford Jersey City SGC !! 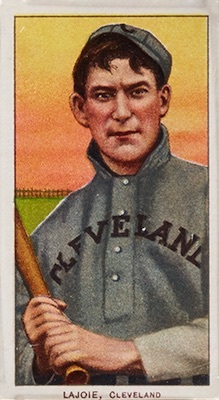 1911 T205 Frank LaPorte Browns SGC 45 !! 525 cards. Shop for base cards on eBay. The cards are listed in alphabetical order by last name. Notations are included to distinguish cards for those players that have multiple options or variations. 1909-11 T206 Al Burch "fielding" Dodgers PSA 3.5 !! T206 George McBride PSA NM 7. Sweet Caporal 350. Extremely Low POP.